I’ve been busy the past couple months designing sock patterns for Yarnbox. This one is for the February Yarnbox Socks. The yarn is Holiday Yarns Silver Sock, and I wanted a relatively simple pattern to take advantage of the semi-solid color and the silver sparkle. They have the added advantage of being a pretty quick knit, but also not too boring. I might have to make a second pair for myself! 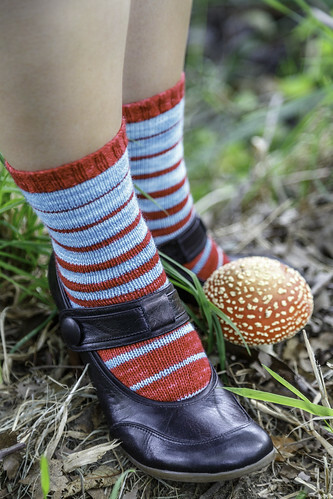 I have a new sock pattern out now, Plumosa, which is part of a Yarnbox Holiday Box. It’s also available on Ravelry. This sock is knit in Sweet Georgia Yarns Superwash Sport in the color Deep Cove, which inspired the pattern. I knit it at 7.5 sts / inch, so many knitters may also be able to use a heavier sock weight yarn. The pattern features a lace panel on the front of the leg with beaded rib on the rest of the sock. It’s a pretty easy and quick knit, and eligible for the Indie Giftalong if you’re planning to finish soon! For the third post in our Three Fates Design Challenge, Cory and I are talking about photography and aesthetics. You can see Cory’s post about it here. My aesthetic isn’t something I think about much. I don’t have a way that I describe it, I just know what I like. For a long time all my patterns were socks, which I think had a big influence on my pattern photography. One thing which I really dislike is when socks are photographed in big full body pictures and the details of the sock itself aren’t visible. For my primary pattern photo I tend to use a fairly close shot of my knitted item with a relatively plain background. That said, I do appreciate more “fun” shots, but I find it can be hard to strike a balance. I love this photo of Intercalate, but to be honest it isn’t the best example of the details of the sock. More recently, I’ve expanded into designing other accessories. For my non-sock patterns, I had to use a slightly different strategy. Cowls look best on a model, and photos which are shot very close don’t necessarily look as good as those with a little more background. Also, as time has gone by I think I have grown even more fond of photos with a bit more interest in the background. As for my aesthetic, I strongly prefer outdoor photos. In fact, I’m a bit obsessed with photos that involve nature, and Seattle is a place with a lot of natural beauty to take advantage of. This has nothing to do with the knitted item itself, which could be shown very well in an indoor shot with a plain background. I think, in the end, that I want my pattern photos to be pretty pictures in their own right and also to be good photos of the knitting project. This post is part of the Three Fates Design Challenge with Cory of indie.knits. You can see Cory’s post on color here. I don’t know that I’ve ever really thought of myself as someone who is skilled at picking color combinations, but I have definitely chosen some nice ones over time. There are rules and methods, and I don’t follow any of them. I just pick two (or more) colors that I think look good together, and put them together. I’m a fan of pairing neutral colors with bright ones, usually black, charcoal, or grey with bright turquoise, green, or pink. Lately, as you can see in the Martinmas Shawl above, I’ve been liking the dark grey & blue combination. It’s also Three Fates Yarns, (MOCC and woodsmoke), and quite similar to my combination for the Three Fates Design Challenge. Although I’m not a fan of knitting stranded colorwork, I do like stripes and blocks of color. A little hint about the design to come. This past week was the Puget Sound LYS Tour. 26 local yarn stores get together for a tour complete with passports, prizes, free patterns and yarn on sale. This year the LYS where I work, Bad Woman Yarn, featured a pattern I designed! Akari is a traditional type of Japanese shoji screen. These screens are often made of washi paper and bamboo, and have a pattern that looks a lot like this cowl. This version is knit in Tosh Merino DK in Mica and Ink. Now I’m knitting a new sample for photography. This pattern will be released in an expanded version and will be for sale on Ravelry.